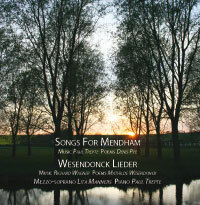 "Having the idea and being prepared to back it was only the preliminary step in commissioning the 'Songs for Mendham'. My wife Lesley and I needed much more, of course. First a poet and a composer with the talent to translate the timeless beauty of Mendham into evocative words and music, and then a soloist and musicians to perform the songs as movingly as their creators had conceived them in their imaginations." - Michael Allen.